Last Saturday started out quite frosty. 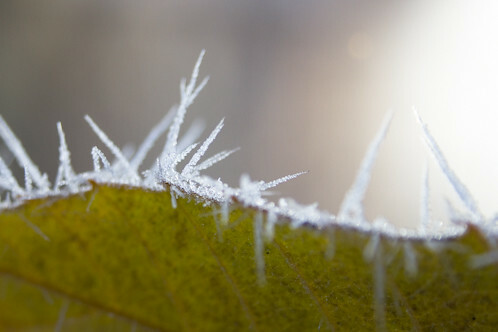 At our annual Thanksgiving event at Audubon, I mentioned to an elementary school teacher that I had been out earlier photographing the hoarfrost. This led to a conversation about the word and the fact that it has showed up in a second grade reading test. Many of the teachers in her school had never heard the word before. According to the Online Etymology Dictionary, the word comes from the Old English word har, which means gray, venerable, old, the “gray” referring to a nobleman’s gray hair, I suppose. 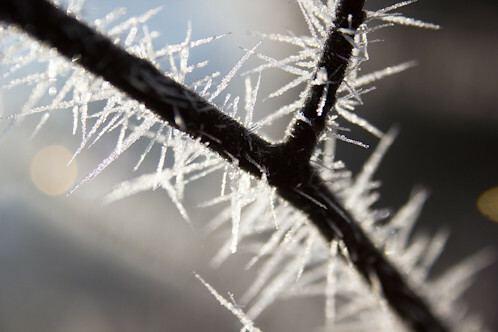 Cal Tech has a wonderful website that explains that frost and snowflakes are formed in a similar way when water vapor condenses directly into ice, skipping the liquid water stage. 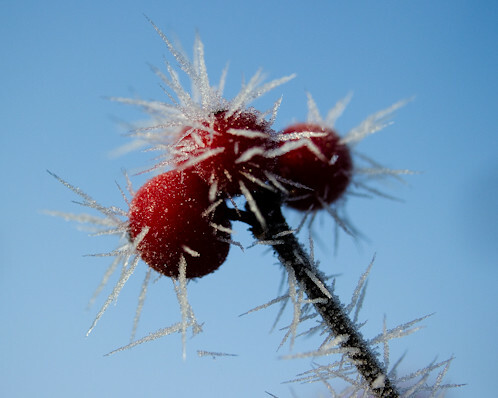 The difference is that snow forms around dust particles suspended in the air, while frost forms on objects on or near the ground. 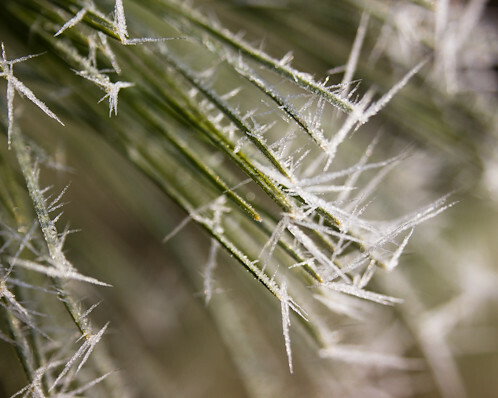 When frost crystals grow beyond a fine white coating, they earn the name hoarfrost. Last Saturday, the whole world was covered in the stuff. If I had been dressed more properly for the cold, I might have stayed out longer to take more pictures! 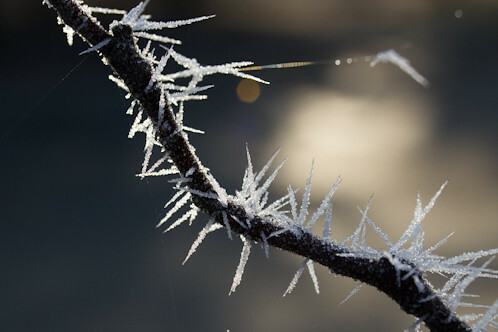 Google search for hoarfrost images. This entry was posted in ice, weather. Bookmark the permalink. Thanks for educating us again. You’re photos are perfect examples as always. Beautiful captures and very interesting post. I didn’t know it was named horfrost images. Beautiful! And thanks for the explanation of how this happens. I did not realize that water vapor could go straight to ice without a liquid stage in between. 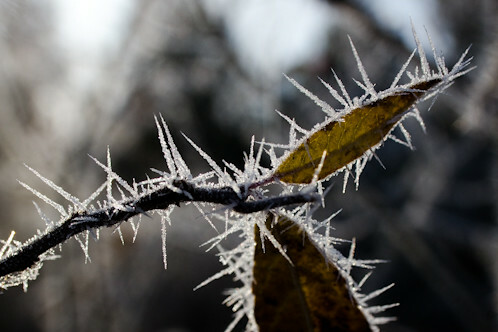 I never noticed hoarfrost until we moved out here into the country, and it has been a puzzle until now. 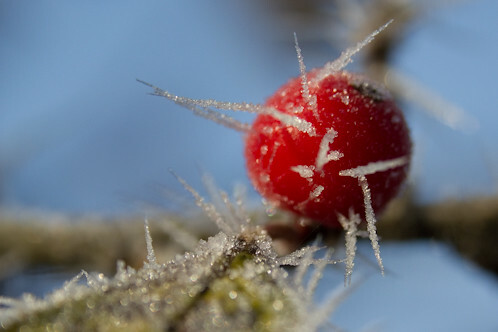 The 3D look at frost encourages me to stop and see what winter messages await me this year. Our December weather is starting just as weird as our November weather. Yesterday I woke up to 15.5 degrees and Spring Peepers calling. This morning it is 1.5 and only traffic noises heard from the porch. I, too, heard spring peepers a day or so ago, AND found a dandelion in bloom. Cold today, though! 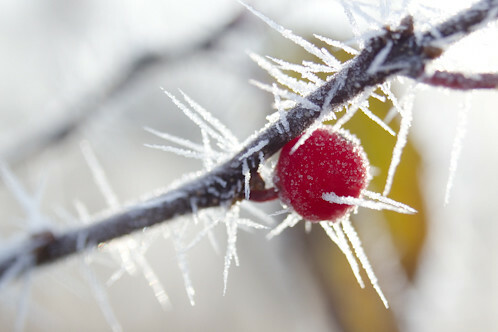 I have never seen such lovely frost photos. Wonderful shots. I was directed to your blog by Sybil of Eastern Passage passage. Glad I found you!